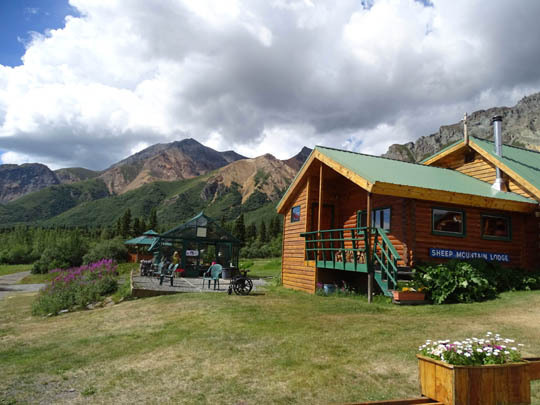 the longest event of its kind in Alaska and it begins and ends at Sheep Mountain Lodge. There are also 50-, 100-, 200-, and 300-mile races starting at the lodge . 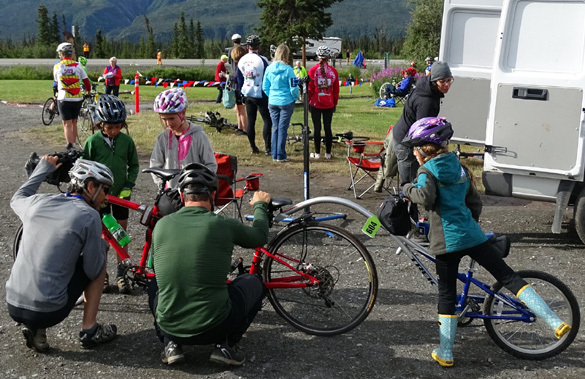 . ."
We first learned about this popular Alaskan endurance bike ride from, of all sources, the 2015 Milepost book when we were planning our trip to the Far North several months ago. 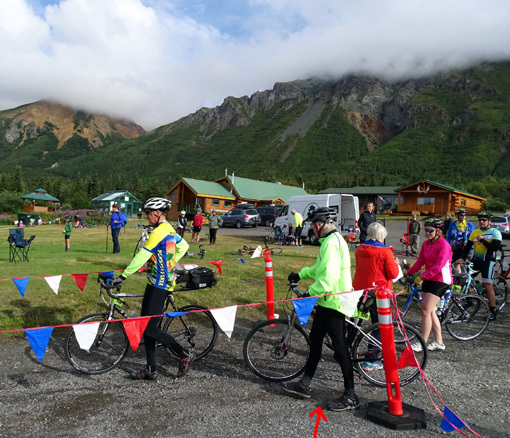 Ditto with the 148-mile ride from Haines Junction, Yukon to Haines, Alaska called the Kluane to Chilkat International Bike Relay (KCIBR). 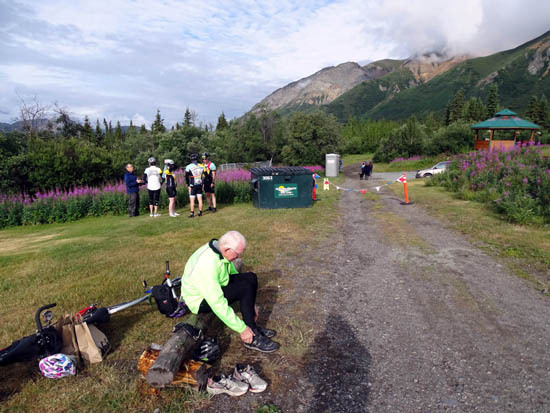 Jim was interested enough to enter the solo division of that event and we made campground reservations for two weeks in Haines, AK. 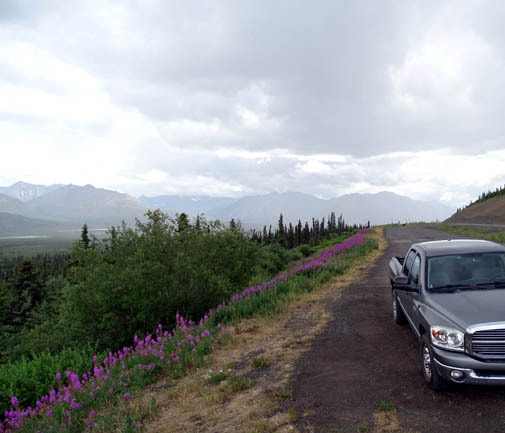 While we were planning the rest of our Alaskan adventure I found information about the Fireweed 400 event in the section of the book about the Glenn Highway. I suggested it to Jim and he immediately read everything he could find on the race website. 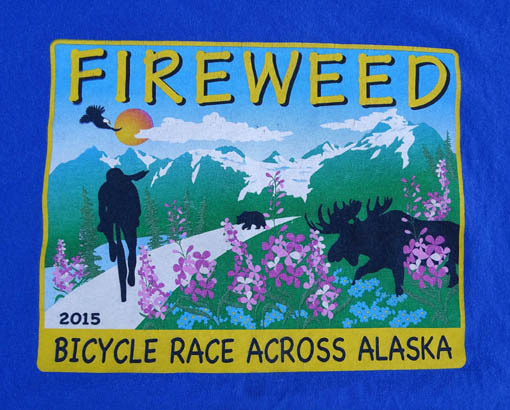 The Fireweed 400 was several weeks after the KCIBR event, which would allow Jim sufficient time to recover and do either the 100- or 200-mile event in the Fireweed 400 (no interest in the 400-mile event, thankfully!). He decided to enter the century ride mainly because crewing and the post-race trip home would be so much easier. 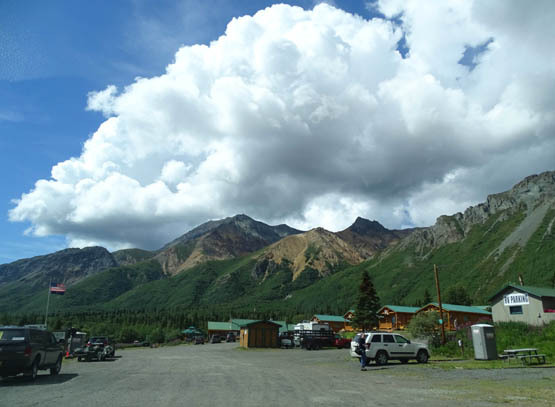 The 100-miler starts and ends at Sheep Mountain, just three miles from our campground. 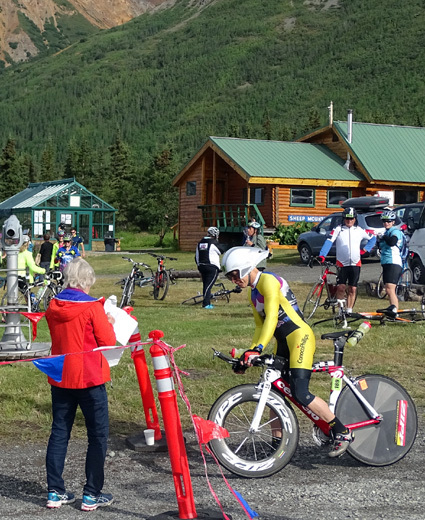 The logistics are much tougher for the 200-mile event, which starts at Sheep Mountain . . . and ends 200 miles away in Valdez. 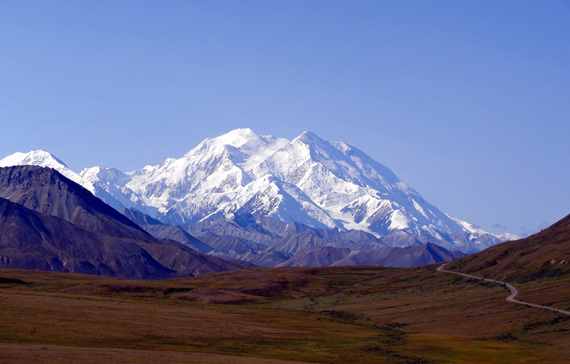 That would require a lot of miles driving the truck during and after the race, as well as staying overnight in Valdez tonight instead of in our own bed. Since even the 400-mile event is out-and-back, it seems like the 200-miler could also be structured that way to make logistics easier on crews and riders. 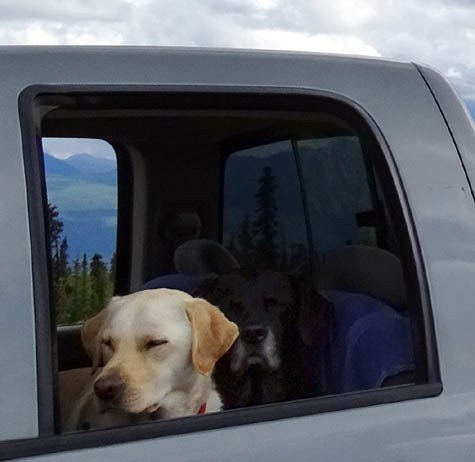 Crew dogs Casey and Cody look pretty sleepy by late afternoon. We were waiting at Tahneta Pass for Jim to come through. As it turned out, the drive along the Haines Hwy. 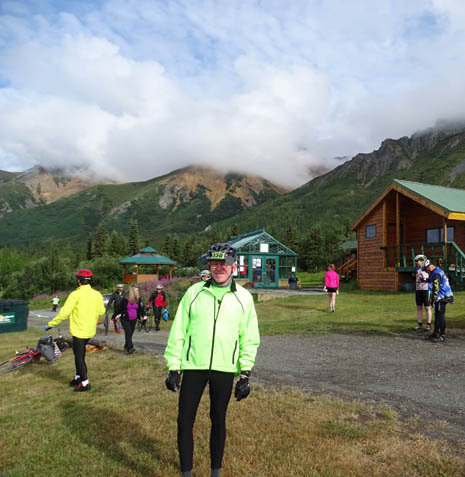 from Haines Junction, YT to Haines, AK convinced Jim that he probably wasn't prepared to complete the paved KCIBR event solo, on a mountain bike, in June within the time limit. 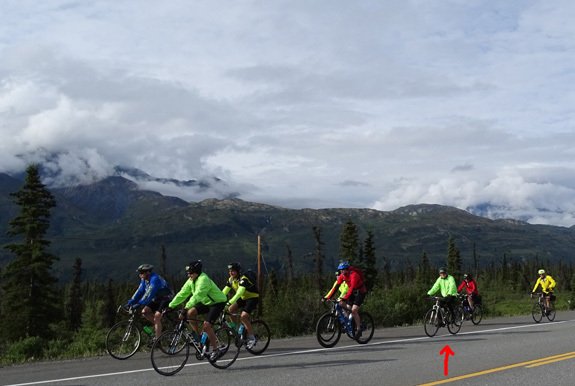 He decided not to do that ride and we shortened our stay in Haines to just one week instead of two. 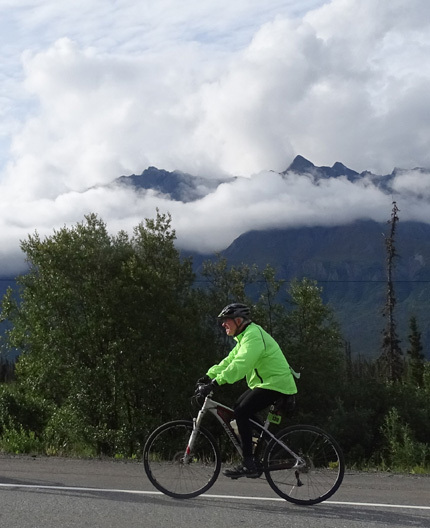 Jim continued training hard for the Fireweed Century event, however, and rode 48 miles of the course (the return leg of the out-and-back course) on our way from Valdez to Anchorage. I wrote about that in the June 22 entry. 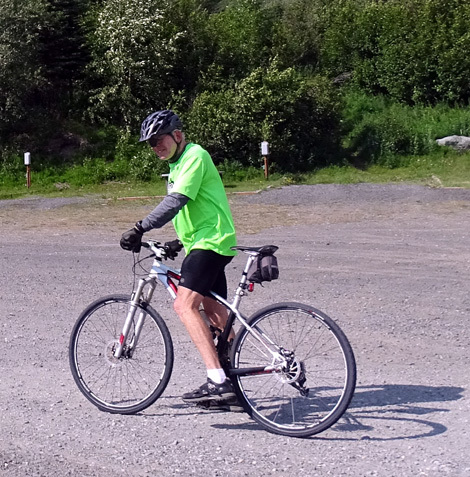 Jim looked great at the end of those 48 miles on June 22. 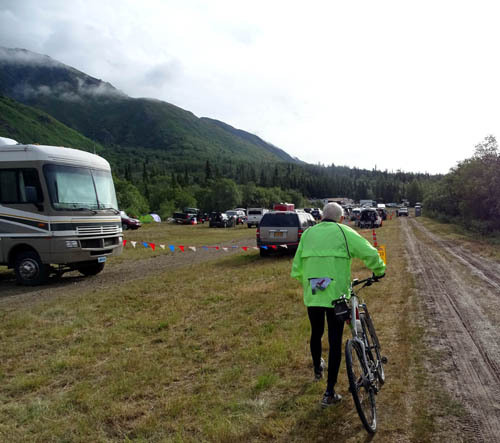 Riding all but two miles of the course gave him the confidence that he could complete all 100 miles solo on his mountain bike within the time limit on race day -- and he did (sorry for the spoiler!). His time on a paved course like this would have been appreciably faster on a light road bike with skinny tires but he doesn't have a road bike, just this Specialized Stump Jumper mountain bike. He has been training with fairly "slick" tires on it so he has less resistance but it's still heavy compared to a road bike. 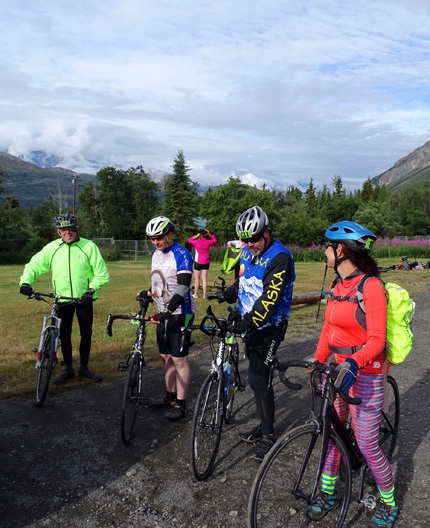 Now here we are at Grand View RV Park, just three miles down the road from the start/finish of the Great Alaska (Fireweed) Century ride at Sheep Mountain Lodge. This entry covers pre- and post-race activities and the race itself. 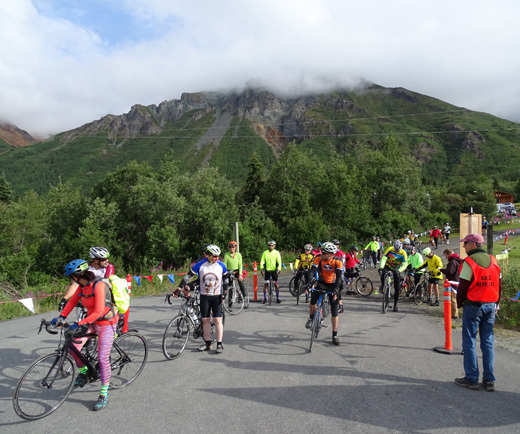 Since many of the riders in this event come from metro Anchorage, they could opt to pick up their packets two days before the race at the BP Energy Center in town rather than wait until Friday to get them at Sheep Mountain. 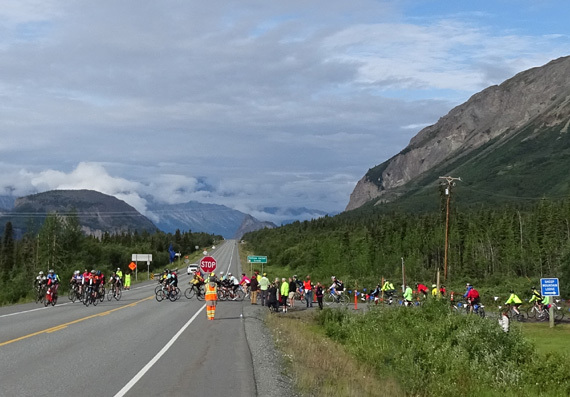 The 300- and 400-mile riders began their races that day (Friday). 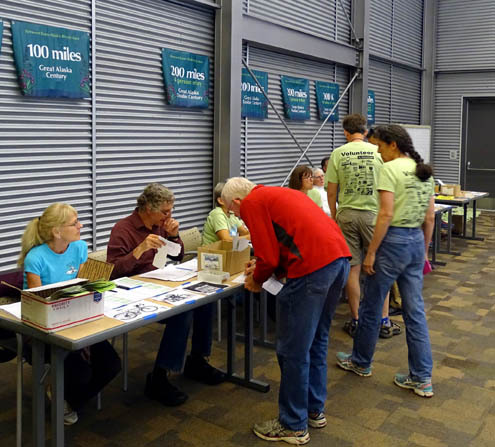 The 200-milers started early this morning (Saturday). Jim's event for non-competitive riders began at 9 AM, and the competitive century riders a few minutes later. The two 50-mile events started after that. Everyone needs to be done by 6 PM today for an official finish. 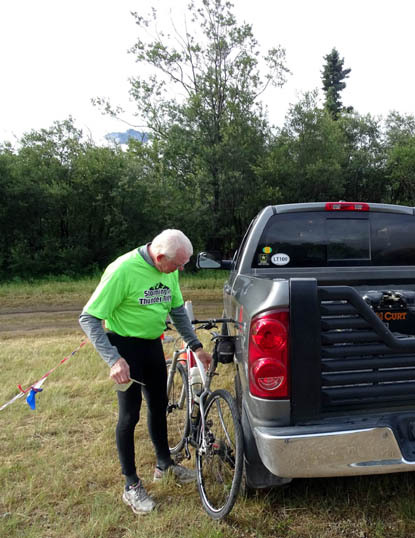 There are multiple team categories and two solo categories (recreational, with no awards, which is Jim's category, and competitive time trials for awards) at all the distances. 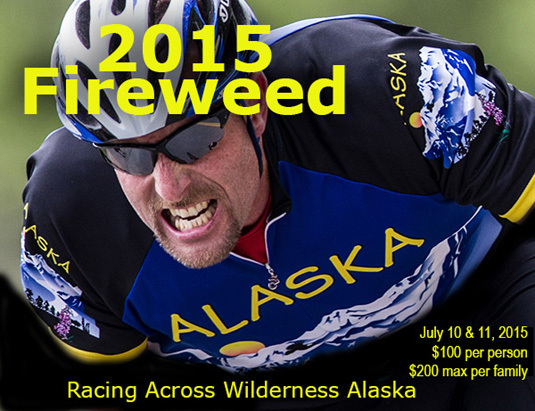 There are over 600 total participants this year in the Fireweed 400. That's a lot of riders and categories for race officials to monitor but they've had several years to perfect the event. Jim talked to a few volunteers and the RD at the lodge greenhouse yesterday to ask some last-minute questions. 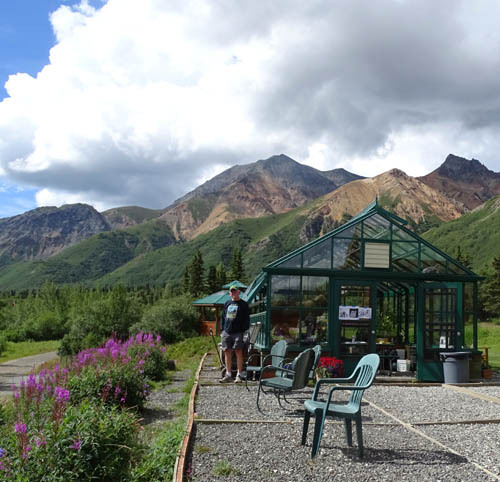 Jim stands outside the little greenhouse. Note the fireweeds -- they're everywhere. 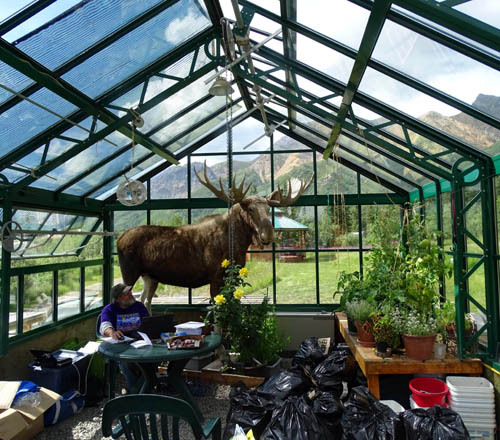 The Fireweed race volunteer is overshadowed by a stuffed moose. Jim also talked to some people in the campground who have ridden the race previously. By Friday evening, he was pumped and raring to go! Well, except for some rain, the race went pretty well from our perspective. 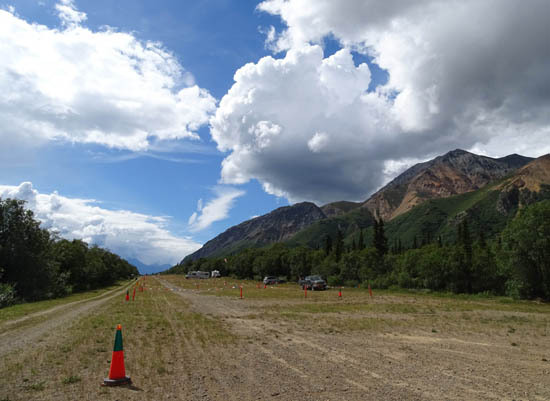 Jim had a successful race and the dogs and I had fun crewing him in the truck along this scenic stretch of the Glenn Hwy. We awoke to sunshine and clouds, with temps in the low 50s F. There was a 40% chance of rain in the vicinity and we both ran into intermittent showers during the afternoon while the race was in progress. That was obviously more of a challenge for Jim than for me. Temps got to the mid-60s F. before the gray clouds came in, and some of the overlooks were windy. Jim had a tailwind at the beginning of the race, heading east. After the turnaround at MP 162, he had mostly a headwind (plus rain) going westbound on the return leg of the race -- when he was more tired from the miles already covered and he had a net elevation gain. But he's tough, well-trained, and just kept going. He'll be the first to tell you that 100 miles on a bike is easier than 100 miles on foot. 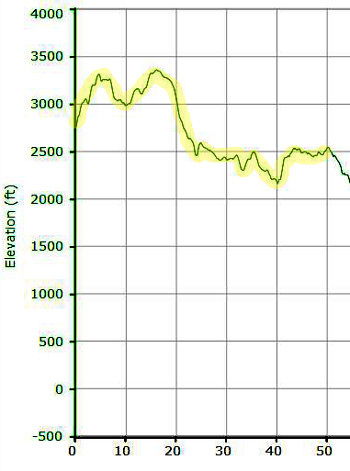 Per his GPS, total elevation gain and loss over the 100 miles was 8,835 feet. The first 6.5 miles were mostly uphill so it's good that he had more of a tailwind then and he was fresh out of the gate. It was also nice to have most of the last 6.5 miles downhill, I'm sure! Jim talked with some other folks in the 100-mile ride, which began at 9 AM with about forty recreational cyclists, then headed for the start when riders in his category were called..
Jim was in good spirits at the start and throughout the race, although he was obviously tiring out by 75 miles. I went back to the truck and left the start area before all the 50-milers got on the road so I didn't have to drive past them to get to my first crewing point eight or ten miles into the course. Continued on the next page -- let's go see how Jim's doing!